. This kind of information is used to help ships avoid collisions with the whales, which is a good thing for both the whales and the boat owners. 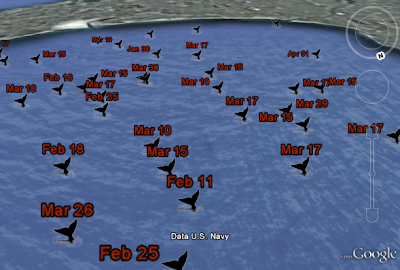 Kurt Schwehr at the University of New Hampshire and Tim Cole at NOAA worked together to pull this data into Google Earth so you can see where the whales have been spotted so far in 2009. You can take a look for yourself in Google Earth. Kurt's blog explores many other neat uses of Google Earth and other technologies for understanding the ocean. Another recent example: you can follow the Healy, a US Coast Guard Ice Breaker, as it makes its way through the Arctic, with a new image every hour from the ship. Right whales, once abundant, are now on the endangered species list. Working with non-profit organizations and the general public, NOAA works to monitor the whereabouts of these whales through their Sighting Advisory System. This kind of information is used to help ships avoid collisions with the whales, which is a good thing for both the whales and the boat owners. Kurt Schwehr at the University of New Hampshire and Tim Cole at NOAA worked together to pull this data into Google Earth so you can see where the whales have been spotted so far in 2009. You can take a look for yourself in Google Earth.